eharmony sets itself apart from other online dating sites by offering compatibility matching based on its patented 29 "Dimensions of Compatibility". These dimensions have helped create long-lasting relationships for over a decade now, and users still swear by this tried and true method. And with someone on eharmony finding love every 14 minutes, it leaves little question that eharmony has got its personality matching system down pat. eharmony offers 2 different packages, the standard membership and the premium membership. Each one provides different features and pricing options so that users can select the one they like best. The two plans also vary slightly in the features offered with each. Obviously, the premium membership will bring you significantly more in terms of communication with your matches. In addition, eharmony offers its well-renowned personality assessment. Although eharmony’s premium membership offers a more in-depth personality assessment, even the standard version leaves you with new insight about yourself and your ideal partner. Exchange 10 "Must Haves" and 10 "Can't Stands"
eharmony's Open Communication System provides the ability to interact freely and securely without transferring any contact information until the necessary time. Singles who are mutually eager to proceed can opt for a Fast Track communication through which they bypass the Guided Communication stages. eharmony's enrollment questionnaire contains approximately 258 questions that were carefully chosen based on the company's 3 year study of 5,000 married couples. The goal of the questions is to encourage you to provide a detailed outline of your preferences and relationship goals so that eharmony's technology can provide successful compatibility matching. The registration process should take approximately an hour to complete, but since eharmony provides match suggestions upon completion, the time required for the searching is minimal. Like other compatibility matching services, eharmony provides a personality analysis that probes into different aspects of your character. eharmony's personality profile was accurate in describing me as a person, and I felt the evaluation offered more focused insights into a greater number of personality traits than any other questionnaire. eharmony offers both phone and email customer support. I tried to call the customer service center at 2:36pm EST on a Monday afternoon. After 3 minutes of waiting on hold, the customer service representative answered my questions about the registration process helpfully. Overall, the phone service went above and beyond expectations. eharmony's email customer service was also excellent. I submitted a query at 1:43pm EST on a Thursday and received a response at 3:16pm the same day. The response was personal, helpful and encouraging. I asked if there was something wrong with my profile settings since I didn't receive as many matches as I had expected. There is no option to pay for one month at a time. eHarmony was amazing for meeting compatible matches based on personality and expectations. The downside is that there is no criminal history check, no income verification check, credit check, etc so you must rely on what you are told by the matches. Unfortunately I met and dated someone who was not honest about who they were and I wasted a lot of time before finding out that the match was not who they claimed to be. eHarmony is actually a great was to meet great matches, I just wish there was more of a background check as an additional option. I enrolled with e Harmony after have been with that disgrace called Plenty of Fish which for me has been Plenty of Frustration 99% of the time. Since I have been with e Harmony, they have respected me as a client/customer, sent me very good useful dating information. Matched me with my dating preferences which are women of Asian/Pacifc Islander background. 7 weeks with e Harmony, I have already received messages from 6 women as compared to Plenty of Farces 1 in 8 weeks with them. e Harmony is being underrated, I'm totally satisfied with e Harmony overall,, it gets 5 stars in all areas, another one that wasen't rated in the top 5 with consumer reviews is Christian Mingle which sshould & ought to be rated with e Harmony, Zoosk & Match.com as well as Our Time. 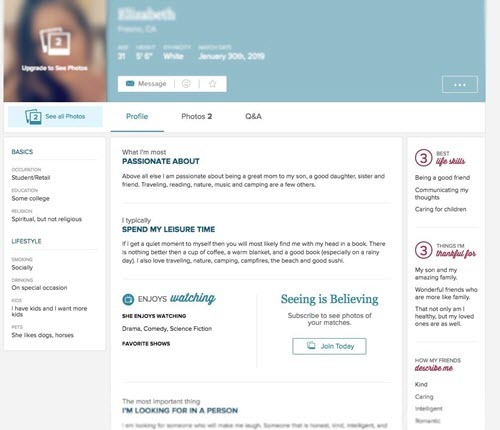 Plenty of Fish is the very worst online dating website that should be rated last in all areas. This is the best dating site for people who are serious about having a relationship. I tried other sites and the match making feature on this site is the best of any site out there. If you're just looking for a hook up, this is not the site for you. I had used this site and there are some very nice people on here, but the one thing I would say is that the people on here are in a rush to get married. Getting Married or even a true, serious relationship takes time to build, but the people on this site seem to want to rush into something very serious to start a family, rather than truly find real love and move forward from there. I met someone through this dating service and found it to be amazingly accurate in their personality assessments. I am seeing the person I met through this service and have moved to the state he lives in. We are continuing to develop our relationship. Hats off to E-Harmony for their matchmaking capabilities, but most importantly hats off to God to leading me to your service. Great site! I met several nice men. I actually was matched with the man I am currently engaged to be married this September after the first night I got on the system. I found the matching system worked very well for me. Would like to search on my own, as other sites allow, as the first 50 or so matches just didn't cut it. Also, but I'd like more initial clues to the socio-economic status of the matches they send.